There was just me and the lonely fox on the streets of Spitalfields before seven this morning as I made my way up to Columbia Rd to have a chat with Anthony James Burridge. He is the first member of this celebrated family I have spoken with, but in coming weeks I hope to introduce you to them all, because their story is interwoven with that of the flower market here over several generations – the Columbia Rd aristocracy. “They might not all be called Burridge but there’s quite a lot of us working here, brothers, cousins, sisters and uncles,” explained Anthony with a cheery grin that belied the chilly morning, while at the next stall, his son (also Anthony James), who started three weeks ago selling winter bulbs, shivered in the cold. 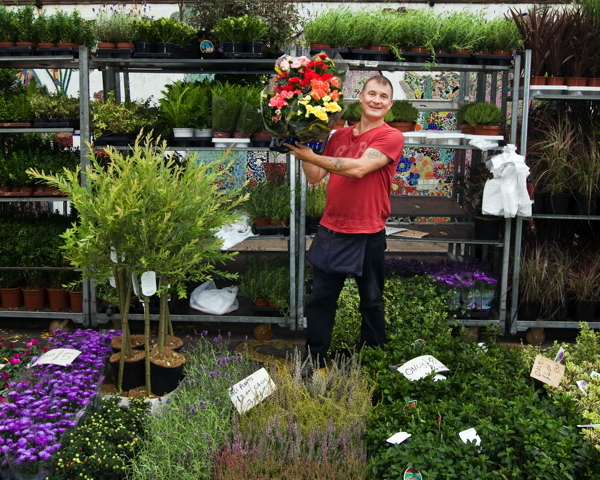 Shrubs and small trees are Anthony’s speciality, including evergreen shrubs, conifers, Camelias, topiary, and Winter Chrysanthemums, though I spotted some interesting bedding plants including a special favourite of mine, Gentians. Over the years, he has learn what plants work best in the small gardens of the East End. When I asked Anthony how he dealt with the cold, he told me that he keeps the house plants in the van until it is time to sell them so they do not get spoilt by the frost, without realising that I was enquiring about his own welfare. “You get used to it. You put on an extra coat and an extra couple of jumpers. You pull your hat down over your ears and get on with it!” he declared with sparkling eyes of anticipation, looking up to the beautiful clear sky of dawn breaking over us and in hope of a sunny Autumn day that will bring plenty of eager customers to the flower market.